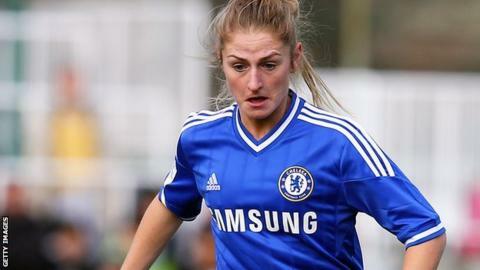 Laura Coombs, Eni Aluko and Katie Chapman hit the goals as Chelsea beat Manchester City 3-1 to reach the FA Women's Cup semi-finals. Notts County earned a 2-0 quarter-final win against Portsmouth. Chelsea and Notts join Everton in the last four after the Toffees beat rivals Liverpool 2-0 on Saturday. The fourth semi-finalists will be either Birmingham City or Arsenal, the tie having been delayed due to Blues' Champions League outing on Sunday. Coombs gave Chelsea a seventh-minute lead with a 20-yard volley that flew in off the inside of the post. City were level five minutes later, striker Toni Duggan scoring from the spot after a foul on Jill Scott by Chapman. But the visitors regained the lead in the 16th minute as Aluko raced past two defenders to take the ball round goalkeeper Andrea Worrall and shoot home. Duggan and striker Natasha Flint both failed to take good chances to give City a second equaliser. And those misses proved costly as Chapman made up for her earlier error by heading in Chelsea's third goal 14 minutes into the second half. The home side hit back hard in the closing stages and Flint was unlucky when her 80th-minute shot struck the woodwork. But Chelsea, losing FA Cup finalists two years ago, held on with no further scares. Women's Super League leaders Notts had to wait until the final 20 minutes to overcome plucky Premier League Southern Division opponents. In a brisk start by Notts, central defender Rachel Corsie had a sixth-minute header cleared off the line. Right winger Dunia Susi went close on a couple of occasions as the visitors edged the first half. Pompey were dealt a blow when lively striker Charley Wilson sustained a 34th-minute injury and had to be substituted. But the Notts goal as well as Pompey's came under pressure before Bradley broke the deadlock with a powerful 72nd minute header. The game was won three minutes later as Clarke raced on to a through-ball to shoot past goalkeeper Sadie Blakely.